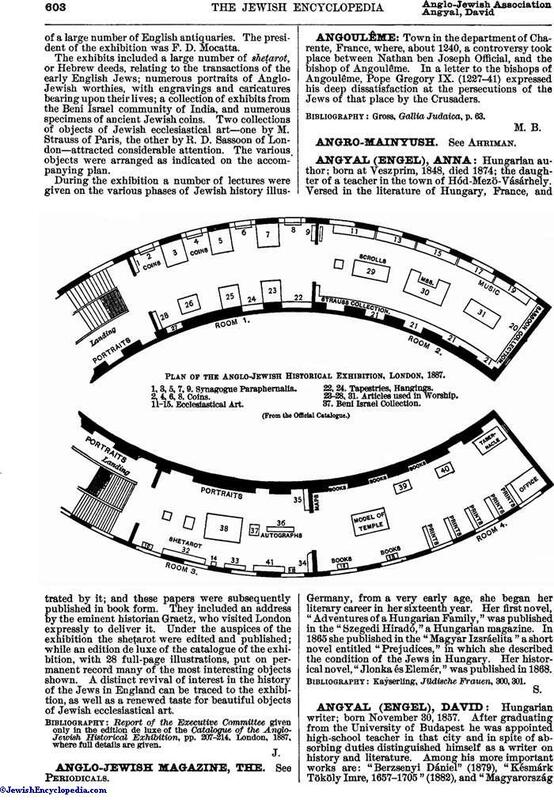 An exposition held at the Royal Albert Hall, London, England, during April, May, and June, 1887, in which were collected and shown most of the antiquarian remains illustrating the history of the Jews in England, together with a collection of objects of ecclesiastical art and miscellaneous Jewish antiquities. The idea of the exhibition originated with Isidore Spielman, who enlisted the cooperationof a large number of English antiquaries. The president of the exhibition was F. D. Mocatta. The exhibits included a large number of sheṭarot, or Hebrew deeds, relating to the transactions of the early English Jews; numerous portraits of Anglo-Jewish worthies, with engravings and caricatures bearing upon their lives; a collection of exhibits from the Beni Israel community of India, and numerous specimens of ancient Jewish coins. Two collections of objects of Jewish ecclesiastical art—one by M. Strauss of Paris, the other by R. D. Sassoon of London—attracted considerable attention. The various objects were arranged as indicated on the accompanying plan. During the exhibition a number of lectures were given on the various phases of Jewish history illustrated by it; and these papers were subsequently published in book form. They included an address by the eminent historian Graetz, who visited London expressly to deliver it. Under the auspices of the exhibition the sheṭarot were edited and published; while an edition de luxe of the catalogue of the exhibition, with 28 full-page illustrations, put on permanent record many of the most interesting objects shown. A distinct revival of interest in the history of the Jews in England can be traced to the exhibition, as well as a renewed taste for beautiful objects of Jewish ecclesiastical art. 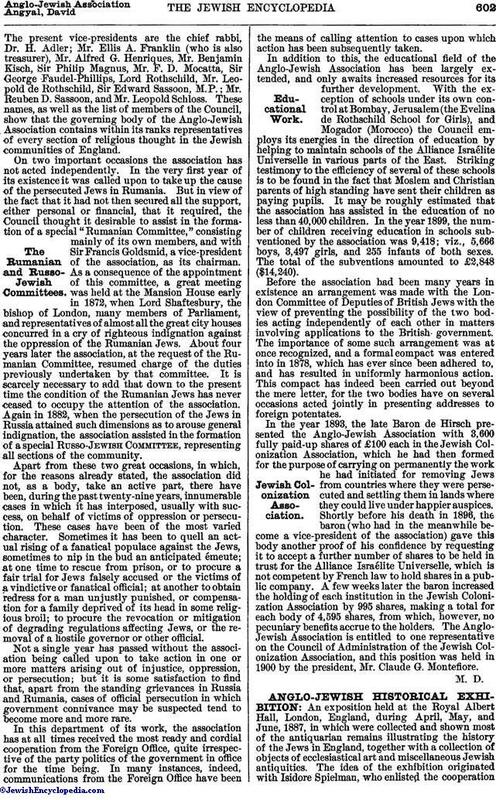 Report of the Executive Committee given only in the edition de luxe of the Catalogue of the Anglo-Jewish Historical Exhibition, pp. 207-214, London, 1887, where full details are given.